Happy Independence Day, everybody! Americans celebrate this day in many ways. For most of us it’s full summer weather, a time for gathering outdoors with family and friends, a day to appreciate that armed militia aren’t patrolling our streets and that we have some important rights and liberties. Cut cherry tomatoes (preferably gold ones) in half. Cube a fresh cucumber, with skin on if it’s a thin-skinned variety. 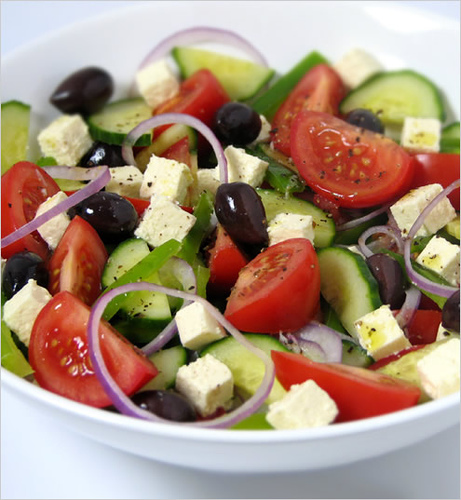 Combine it all with some Kalamata olives, a handful of fresh oregano, and then drizzle olive oil on top. For grilling? 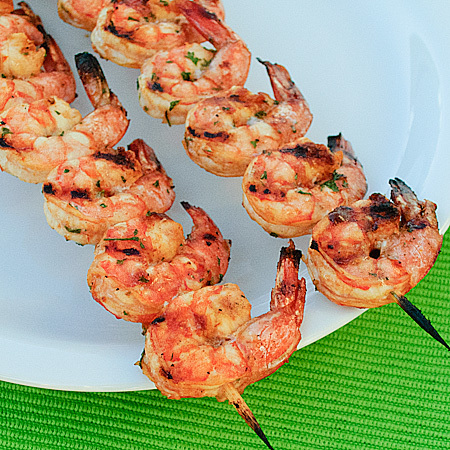 l like to skewer and grill shrimp that I marinated with lime juice, olive oil, chopped fresh cilantro, and a dash of habanero sauce. Or boneless chicken breasts dry rubbed with cumin, chili powder, salt, and a touch of coriander. And dessert: it pretty much has to be red, white, and blue, right? The simplest dish would be local strawberries and blueberries mixed with a spoonful of sugar and a quarter cup of cognac served over vanilla ice cream. You can go all out and make a cheesecake topped with the same fruit mix, or a sheet cake with cream cheese frosting and strawberries and blueberries lined up like an American flag. Whatever you cook today, wherever you celebrate, the Wicked Cozy Authors raise a glass for our freedom – yours and ours – to blog, to write, to debate the questions of the day without fear of recrimination or arrest. Happy 4th! 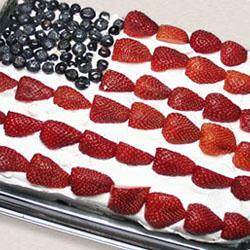 What’s your favorite Independence Day food? And what will you be doing today to celebrate? Edith Maxwell writes the Local Foods Mystery series, the Speaking of Mystery series, short crime fiction, and possibly the John Greenleaf Whittier mysteries, too! Prev Wicked Wednesday- Do you have a favorite summer food? Next Did Liz Miss Malice or Did Malice Miss Liz? Your recipes look so good! I don’t know that I have a particular food for the 4th. But when I was growing up, we didn’t have money for things like soda or chips but on the 4th we were allowed some soda. Two times a year we were able to have soda – Independence Day and the last day of harvest. So I like to have soda and chips, things I really don’t have often. I know what you mean, Elaine! When I was growing up, we only had real button on Christmas and Thanksgiving, otherwise it was margarine. Thanks for stopping by! I think my new favorite Independence Day food will be this cake!! Looks amazing. We’ll have shrimp kabobs today, probably with a fruit smoothie! We are going having dinner with friends. Ken is a fantastic cook and I can’t wait to see what he has planned. I’m in charge of dessert which is a brownie base, topped with raspberry jam, fresh raspberries, and then a combination of cream cheese, powdered sugar, and white chocolate. Then decorated with more fresh raspberries! Mary MTF – thanks for stopping by!